Radiology was finally included when the Office of the National Coordinator for Health Information Technology (ONC) and the Centers for Medicare & Medicaid Services (CMS) issued proposed rules for stage 2 of meaningful use of certified EHR technology earlier this year. While this long-anticipated development was generally met with approval by people in the radiology community, there is plenty of work ahead for imaging informatics professionals. Although radiologists were not explicitly prevented from collecting meaningful use reimbursements under the stage 1 rules, the lack of guidance on medical images made it difficult. The proposed stage 2 rules state that eligible professionals, eligible hospitals, and critical access hospitals can receive reimbursements as long as 40% of scans and tests resulting in a medical image for patients who are admitted to inpatient or emergency departments are incorporated into certified EHR technology. While the “what” has been defined, questions remain about the technology standards that will be used to view and transport images. David Clunie, MBBS, owner of PixelMed Publishing LLC and cochair of the Integrating the Healthcare Enterprise (IHE) Radiology Technical Committee, generally likes where the stage 2 rules seem to be headed, but he has some concerns. He says that although DICOM is specifically mentioned as a means for encoding image sets, the proposed rules don’t address how those image sets will be transferred. He sees a gap between existing cross-enterprise image transfer standards (such as those that the IHE’s XDS-I and XDR-I protocols address) and the guidelines’ potential methods of communication for the images. “There seems to be an implicit assumption in the certification part of the ONC requirements, in the stage 2 proposed rulemaking, that it’s feasible to send images, for example, by e-mail or via [the Nationwide Health Information Network’s] direct push approach, and that may not really be terribly practical,” says Clunie. As more facilities move from CD-based image transfers to electronic transactions, standards will become increasingly important. Whether images are pushed from one point to another, queried and retrieved from a central repository, or sent directly through e-mail, there are standard ways to do that, and XDS-I addresses many of those methods. However, the proposed rules don’t mention XDS-I at all. Instead, the rules reference the XDR profile, which allows the direct transfer of documents and metadata between HIT systems but doesn’t directly address imaging files. Clunie believes transfer standards will eventually be worked out, but he hopes that the requirements will be inclusive of proven solutions rather than prescriptive, which would force facilities to do additional work to become certified and make the new standards less interoperable with currently deployed solutions. A potentially trickier problem is the question of viewing standards. As more facilities have moved toward increasingly capable browser-based image viewers, which can be accessed via a secure log-in, the trend has been to have as little software as possible installed on local workstations to minimize security risks and reduce the need for additional infrastructure. What has yet to be determined is whether standards beyond what already exist in the Web browsers are needed to allow communication between a browser and the imaging server. Clunie says there are arguments for using a standard protocol and arguments for using proprietary methods, but the stage 2 requirements seem to be leaning to the proprietary side, which means that, although DICOM will remain the standard for storing images, it may not necessarily be required for viewing them. While radiologists will certainly continue to use DICOM-enabled viewers, the ambiguity of the proposed rules affects referring physicians. Clunie says it has often been assumed that referring physicians—or anyone other than radiologists—don’t need a full set of diagnostic-quality images. However, surgeons and some other referring specialists demand all images for safety reasons, which is reflected in an American Medical Association resolution on the matter. Clunie says a limited-capability viewer that can handle diagnostic images but has fewer features than a radiology workstation would be a workable compromise. In fact, the IHE has written a Basic Image Review profile that encompasses the minimum browser needs of various user groups. Although the IHE didn’t formally submit the viewer concern during the comment phase of the rule-making process, Clunie believes maybe they should have because defining viewer requirements will help ensure that the technology is useful. 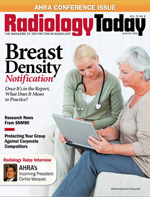 No matter how the transfer and viewing issues are ultimately addressed, it seems certain that the specific mention of imaging in the stage 2 rules will affect radiology. Clunie says many of the imaging-related measures depend on referrers and patients using the EHR technology. This situation basically forces radiologists to become technology evangelists, which helps disseminate the technology but makes more work for the radiologists. Many radiologists believe this is an unfair burden because they have little control over who uses their technology. On the other hand, it doesn’t make much sense to pay incentives for technology that is barely used. More guidance, in regard to what’s required for certification, may eventually be necessary. From an imaging technology standards standpoint, Clunie doesn’t expect many changes when the final rule is released. He notes that the ONC has already spent a lot of time throughout the rule-making process ironing out technical issues, and any changes in that regard will amount to tweaks. The final rule is expected to be issued in the fall.